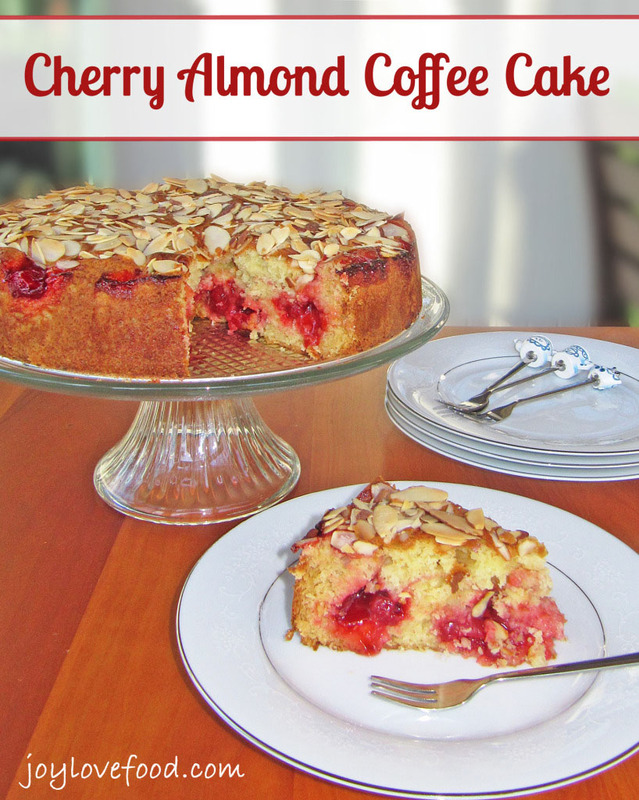 Bursting with red cherries and topped with sliced almonds, this Cherry Almond Coffee Cake is festive and so delicious – the perfect treat for breakfast or anytime this holiday season. 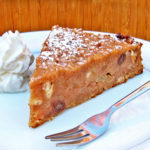 I’ve had my eye on this Cherry Almond Coffee Cake at epicurious.com for a few weeks now, thinking it would be a wonderful treat for the holiday season. I love cherries, I love almonds, and I really love cherries and almonds together. So, I gave it a test run this weekend, and it turned out wonderfully, gorgeous and so delicious. I made only a few changes. I increased the amount of cherries and almonds and used light sour cream, versus regular. My husband, who can be very particular about his baked goods, declared it excellent. I agree and not only is it delicious, it is so pretty to look at. The bright red of the cherries is festive and beautiful and perfect for the holiday season, or any special occasion. When I’m having guests staying at our house, or will be having family and friends stopping by, I love to have a beautiful baked good, displayed in my glass cake dome on the island in our kitchen. Something festive and inviting and allows guests to help themselves. 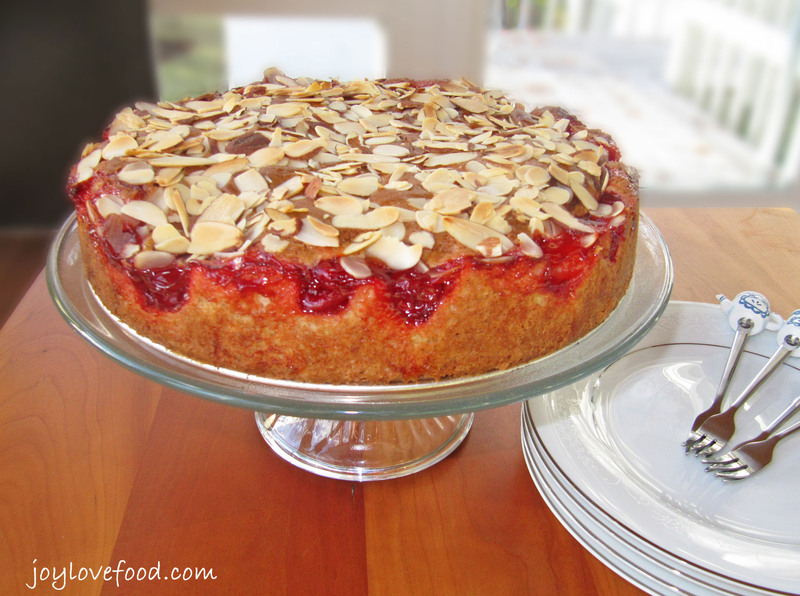 This Cherry Almond Coffee Cake fits the bill perfectly. 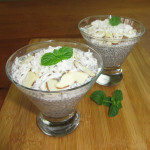 It is so pretty and is wonderful for breakfast, a mid-morning or afternoon snack, or to nibble on throughout the day. 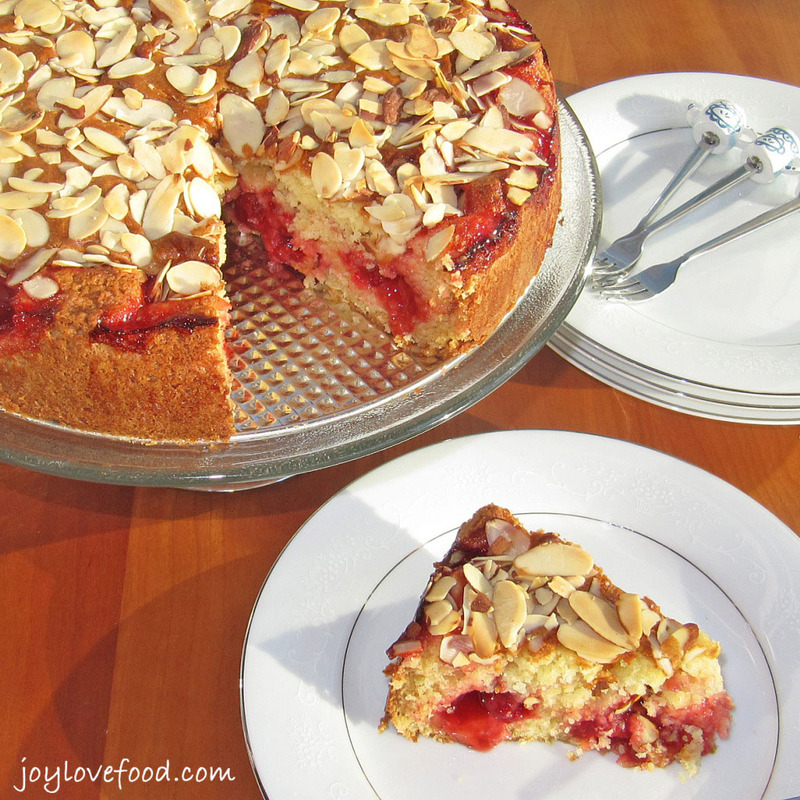 This Cherry Almond Coffee Cake would make a wonderful addition to a cozy family breakfast on Christmas morning. 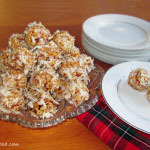 It also will look beautiful and add brightness to a buffet for a holiday or New Year’s open house; or is a wonderful treat to bring to a potluck or coffee hour anytime of year! Bursting with red cherries and topped with sliced almonds, this Cherry Almond Coffee Cake is festive and so delicious – the perfect treat for breakfast or anytime! Preheat oven to 350°F. Lightly grease a 10-inch springform pan. In a large bowl, using an electric mixer, beat sugar and butter until light and fluffy. Add eggs, vanilla extract and almond extract, beat well. Add sour cream to egg mixture, mix to combine. Add remaining half of flour mixture to egg mixture, mix to combine. Pour 2/3 of the batter into prepared springform pan, spreading evenly. Pour cherry pie filling over batter in pan, spreading evenly. Drop reaming batter, by tablespoons,onto cherry filling in pan, carefully spread batter over filling with back of spoon. Sprinkle almonds evenly over batter. 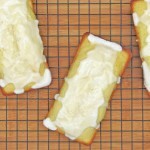 Place pan in preheated oven and bake for 1 hour or until a tester inserted into middle of cake comes out clean. This entry was posted in Breakfast & Brunch, Cakes & Cupcakes, Desserts & Sweet Treats and tagged almond, breakfast, cake, cherry, coffee cake, dessert, holidays, winter. Thanks for sharing your diy at the party your one of the features this week. Happy New Year! Thanks so much for the feature Theresa! Happy New Year! Looks so good Joy! Thanks for sharing at the party. Pinned & sharing! Can’t wait to try your recipe. I bet this would be sooo yummy! Thanks for sharing at Totally Terrific Tuesday! I love seeing all of your goodies and i cant wait to see what the new year brings! jessica recently posted…DIY Epic Fabric Christmas Tree…You’ve Got to see this! It’s a super-delicious looking cake!! Thanks Winnie, thank you for coming by! 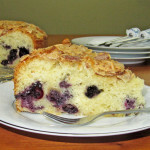 What a wonderful coffee cake…it looks absolutely delicious! Pinning so I can try it! I’ll spread some other foodie love around for you too! Thanks for sharing it with us at Foodie Fridays! Thanks Deborah! Thanks for the pin, hope you give it a try and enjoy! A beautiful elegant cake Joy! This will look so pretty on our holiday table dessert! I have so much to do in the kitchen and yet I still would love to add this one to the list, let me see what I can do. the cake looks very delicious and thanks so much for sharing the recipe YUM!!! Thanks Ria! Thanks for coming by! Yum!! This is beautiful. Coffee cake and almonds are two of my favourite things. Cherries never hurt, either! Love it. Thanks Ginnie! Hope you give it a try and enjoy!